The joy of the lord is our strength, says God’s Word. The Lord gives us this joy as we follow Him. Like a lamp on a lamp-stand, like a city on a hilltop, it cannot be hidden, it must be expressed. When words aren’t enough – we sing. And when song too falters – then we dance like Moses and David and even Jesus himself. Come, join me in the dance. These songs pass on the Lord’s personal invitation to you too. If you find it hard, take the first step… the music will lead you on. Bless the Lord with dancing and God will bless your dance. 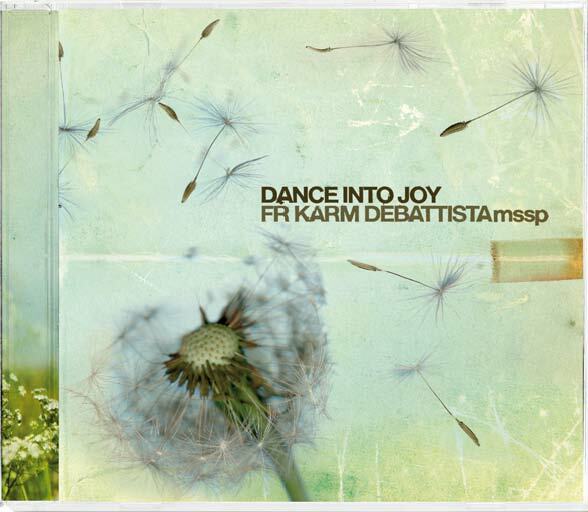 Although this is the 8th album for Fr Karm, Dance into Joy, is his first album in English. The album opens with “His Goodness” taken from Psalm 115 (116) that speaks about how good God is and that there’s no way how to repay for this goodness. This leads us to the title track, “Dance into Joy” as it invites everyone to do likewise. The rest of the album takes different aspects of spirituality, from praying with psalms (His Goodness, In Your dwelling place, Master Builder and Blazing Fire), to personal prayer (Maranatha, Incense, Let me be like you) and to songs of reflection (Ephesian Canticle and I will Live - Lazarus Vigil). One particular song relates to the occasion where the album is launched. The Pope chose “You will receive power when the Holy Spirit comes upon you; and you will be my witnesses” as the theme for this year’s World Youth Day which took place in Sydney, Australia. This song called “Pentecost” speaks about the discovery of the power of God in the gift of the Spirit: we are ordinary people, no heroes, but we’re caught up in a story greater than us. The launching of this album took place in July during the World Youth Day of this year in Australia.